Hungarian director Kornél Mundruczó won the Un Certain Regard prize at Cannes back in 2014 with his satirical canine war fable White God. He returns to UK cinemas this week with Jupiter’s Moon, an ambitious political thriller that puts the ‘high’ in high concept. Aryan (Zsombor Jéger) is a Syrian refugee fleeing Homs, accompanied by his father. As the border police close in, searchlights finds the boats and shots are fired, Aryan swims to land and then flees through the woods with the other refugees. 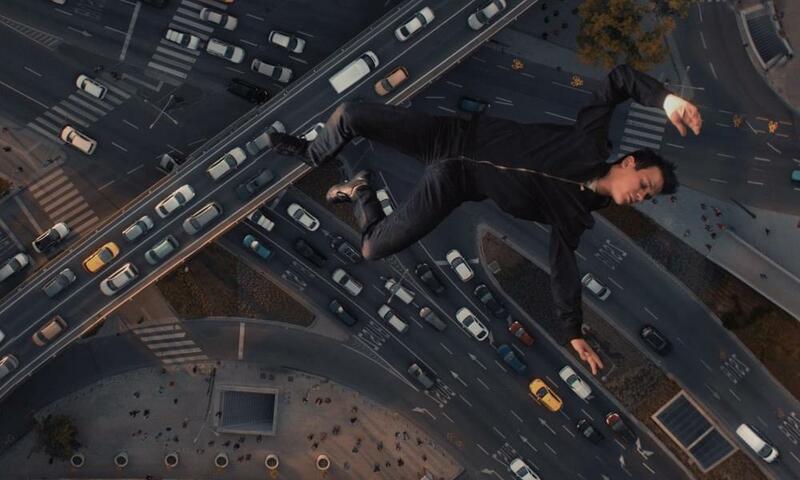 It is an exciting and desperate sequence that Mundruczó films in a dynamic breathless single shot. The first of many eye-popping moments that one suspects might be a calling card to a Hollywood action career. Bela Tarr this ain’t. The cornered Aryan is shot, but bizarrely begins to levitate and here we have the aforementioned ‘high’ concept. Taken to a camp, Aryan falls under the care of rumpled and cynical Dr Stern (Merab Ninidze), who immediately sees an opportunity to make some money from the miraculous powers of the young Syrian. He takes him around a series of wealthy patients, convincing them of Aryan’s healing qualities and cashing in. Unfortunately, the two are pursued by László (György Cserhalmi), a craggy policeman who first shot Aryan and now wants to finish the job with the help of a general contempt for the refugees and a militarised police force. So a disillusioned man guards a lonely miracle through a dystopian near-future – sound familiar? The model is Alfonso Cuarón’s Children of Men, down to Clive Owen’s overcoat and one shot action sequences mixed in with political commentary. The action sequences include a stunning car chase through the streets of Budapest and a terrorist attack on the subway. Whether the political thought surrounding Mundruczó’s magical realism holds up to much scrutiny is another matter. Stern is a disillusioned atheist – he tells some Jehovah Witnesses he believes in the “resurrection of Hungary” – who slowly discovers his soul via Aryan’s innocence and power. There are moments when Aryan is employed rather arbitrarily to take down some of the director’s pet peeves – understandable with the skinhead fascist, not so much when he can’t get French fries in a posh restaurant. It is this occasional randomness that threatens to unravel the film as political critique but then again with Hungary’s current quasi-fascist government perhaps nuance is an inappropriate ask. Jupiter’s Moon is a highly ambitious and thoroughly entertaining trip and if the politics is more backdrop than subtext, what remains is compelling and occasionally beautiful enough for you to enjoy the flight.